Leisure Lakes has developed an exciting new partnership with the Green Commute Initiative. As part of the Government's Green Transport plan, the Green Commute Initiative provides massive tax savings to UK employees who skip cars and public transport. 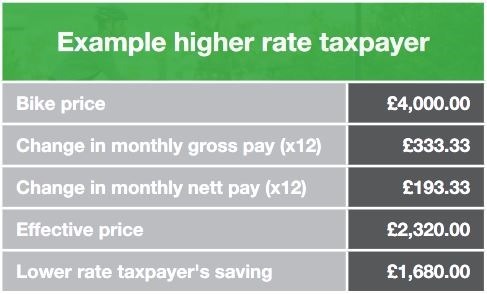 High quality electric bikes are available under the scheme, which sees employees pay for the bike from their gross (pre-tax) salary – saving most of us between 32-42% off retail price. Just Another Cycle to Work Scheme? Unlike cycle to work schemes, the Green Commute Initiative doesn't have a £1000 limit. This means any bike is available – all with the same savings. We know that a lot more people would get out of the traffic, stop relying on buses and travel on two wheels if it wasn't such hard work to cover big distances – especially carrying luggage and without arriving flustered. That's where an affordable electric bike comes in. If you like, we can arrange with your employer for you to try an electric bike free of charge. Keen cyclists who'd rather not have any electrical assistance, you're in luck. The Green Commute Initiative is open to you too – we really mean any bike. Enter your current pay under 'Old Salary'. Subtract the RRP of your new bike from your Old Salary to find your New Salary. Click 'Go!' and see how little your new bike really costs from your take-home pay! Please remember that your pay must still meet the minimum wage after salary sacrifice. Your employer must agree to run the Green Commute Initiative and may choose to put a limit on the cost of equipment. 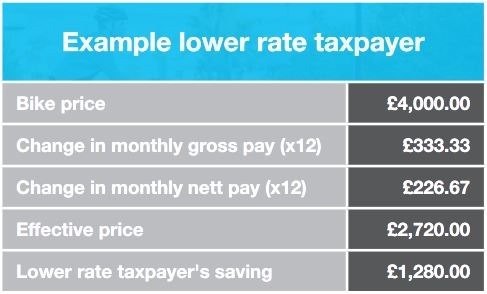 There is no 'End of Scheme Fee' as charged by most cycle to work providers. When the initial period ends, the Green Commute Initiative lend the bike to you for free under an extended hire agreement. They also appoint you as their agent to dispose of the bike to a third party of your choice at the end of the free loan. This transfer can't happen automatically so, in order to comply with legislation, this arrangement costs the employee £1. You can find more information at GCI's website. Organisations who sign up are already reaping rewards – and not just with a happier, healthier workforce who need fewer parking spaces. 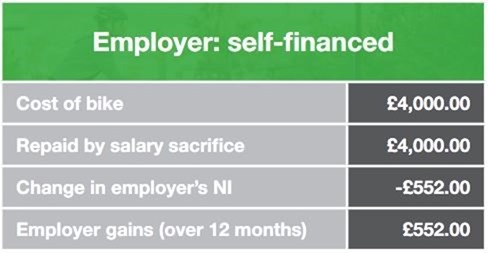 Employer's National Insurance (currently 13.8%) reduces in line with the employee's salary sacrifice. This means the cost of financing the purchase (rather than buying the bike outright) is still outweighed by the employer's savings through running the Green Commute Initiative for their staff. 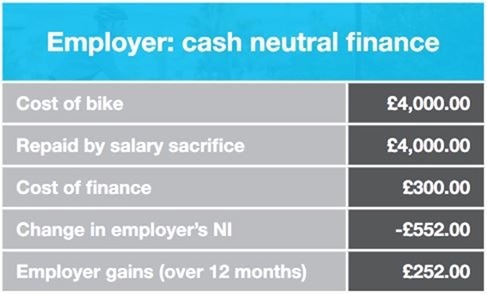 There aren't any other fees for the employer to pay. We want everyone to be able to try electric bikes. Employers who sign up with the Green Commute Initiative can offer each of their staff a voucher for 3 days electric bike hire free of charge. With that, we'll also provide a bundle of essentials including a helmet, lights and lock (which are all available to purchase through the scheme). Signing up to the Green Commute Initiative takes 2 minutes and implementing it is easy. Payroll figures and paperwork are all provided. Check out more info and see how easy it is to sign up. Any questions? Simply email lucy@leisurelakesbikes.com or contact the Green Commute Initiative and we are more than happy to help! Visit any of our 10 UK stores, call us on 01772 644340 or message us on Live Chat and our expert staff can help you pick out which bike and equipment meets your exact needs. If you would like to take part in the 'E for Free' promotion, please ask your employer to register with the Green Commute Initiative. The Green Commute Initiative is authorised and regulated by the Financial Conduct Authority. The Green Commute team have answered the most frequently asked questions so you can find everything you need! Can’t find what you’re after? Please contact lucy@leisurelakesbikes.com or get in touch with the Green Commute team.